Lonnie Hutchinson is an artist of mixed descent, with Samoan, Ngai Tahu and Celtic bloodlines. Very often her practice reflects this, commenting astutely on aspects of indigeneity in the contemporary world. She does this in a wonderful variety of materials. 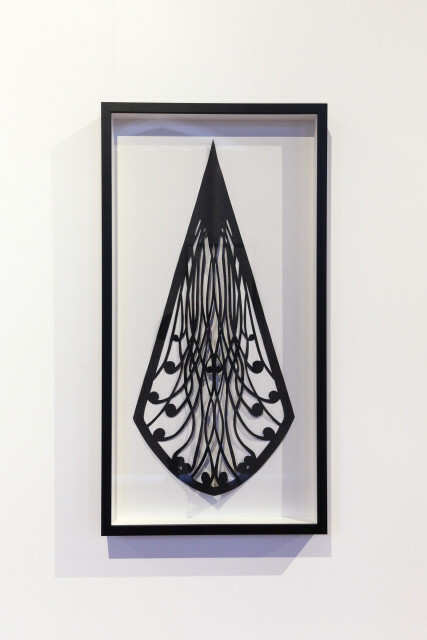 Her signature work involves careful hand-cutting of folded black building paper. The work hangs pinned to the wall, its delicate pattern of tracery repeated in gentle cascades across and down the wall. Twelve years ago she presented in augmented reality (long before it became fashionable), a suite of work that culminated in a public commission extant still in Chews Lane, Wellington. Lonnie has cut corten steel into massive Kowhaiwhai patterns in Hamilton Gardens, and most recently has completed a memorable (computer cut steel) cladding work, based on Kakapo feathers that cloaks the south side of Christchurch’s new Justice precinct titled, Kahu Matarau. Lonnie has fused the personal and the political into a multi-faceted art practice, quietly forging a career as she negotiates opportunities both public and private, big or small, and sometimes static, sometimes moving.